Are you looking to finally get started on those little projects and ideas without making a huge financial investment in a sewing machine? Or maybe you have a budding seamstress or tailor that you want to help get started? Many people don’t realize the a mini sewing machine can be just the perfect solution when you are looking for your first sewing machine, or a mini sewing machine for small and side projects. Mini sewing machines are perfect for beginner sewing, most think it’s just for kids or it won’t perform quite like a “real” sewing machine. Mini sewing machines are just as good if not better for some tasks. Below are a list of positive and negatives for choosing a mini sewing machine. Slower. Some noticeable differences between full size and mini sewing machines might be that a mini sewing machine is a bit slower. This alone makes it optimal for beginner and first time sewing as it allows for more room for error and time allots more time to correct the stitch. Beginner adults and children will appreciate this none rushed paced. Difficulty with thick fabric. Mini sewing machines also might have a few obstacles when it comes to sewing with thicker fabric. As with most sewing machines, a mini sewing machine needs to have the correct size needle installed before sewing denim and thicker fabrics. Save yourself a lot of time and make sure that you are using the manufacturer suggested needle for the job. This will greatly reduce sewing frustrations and having to replace broken needles. Less automated. Many mini sewing machines don’t have an automated zipper or buttonhole capability. While this isn’t a big drawback it does make it more challenging to complete zipper installation and buttonholes. However for beginner sewing it’s highly unlikely that this would be a deal breaker. Might not have a built in light. Though mini sewing machines are light weight and super easy to travel with they do come with disadvantages. Some might not have a built in light. Most full sized sewing machines come with a sewing light already installed as part of the sewing machine. With a mini sewing machine, some consider this a small sacrifice and aren’t willing to pass on a mini simply because of the lack of this feature. When sewing having the correct lighting is a requirement, if you're considering a mini sewing machine you might also find a regular lamp or ceiling light can be easily used for sewing. Quality issues. Some have found the foot pedals on mini sewing machines to be very toy-like and plastic. This is mostly true but can be good for beginner sewing. Easy stitching. Mini sewing machines are great for beginner sewing projects. If you're looking for your first sewing machine, a mini sewing machine might be the best choice for you. Mini sewing machines allow for easy startup and are easy to use right out of the box. Most mini sewing machines come with all of the required bobbins, and needles necessary to begin sewing immediately. It's easy stitch selection and ready to go features make it the perfect selections for first sewing machines. It’s lightweight. These small, portable machines have been reviewed to create even stitches. They are great for lightweight sewing and paper crafting. It’s cheap. 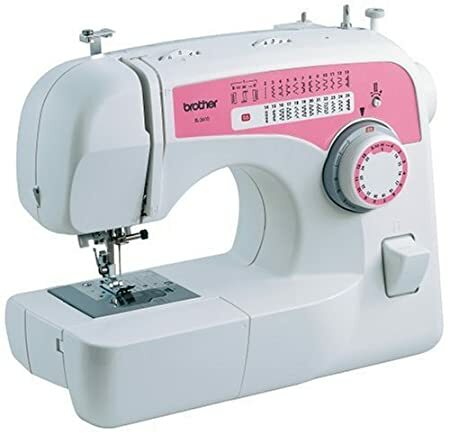 Mini sewing machines have most of the features of a full-size machine and at just a fraction of the cost. This makes this an ideal pick for beginner sewing, first sewing machines and small projects. Overall, we have found that mini sewing machines are definitely the best sewing machine for hobbyists who would like to dabble in sewing. Because of its small size, it also makes it a great first sewing machine for kids or beginner sewing. If you're looking for the best beginner level, mini-sewing machines for basic use these selections might be what you're trying to find. SINGER 1507WC Sewing Machine with Cover Get this ON SALE NOW!